If you’re a big fan of the Grand Theft Auto series, it might be time to start pinching those pennies in order to pick up one of Grand Theft Auto V‘s limited edition bundles. Detailed in the images at the head of this post are two separate limited editions. The Special Edition is the smaller pack, and it includes digital goods as well as a blueprint map, steelbook and artwork. 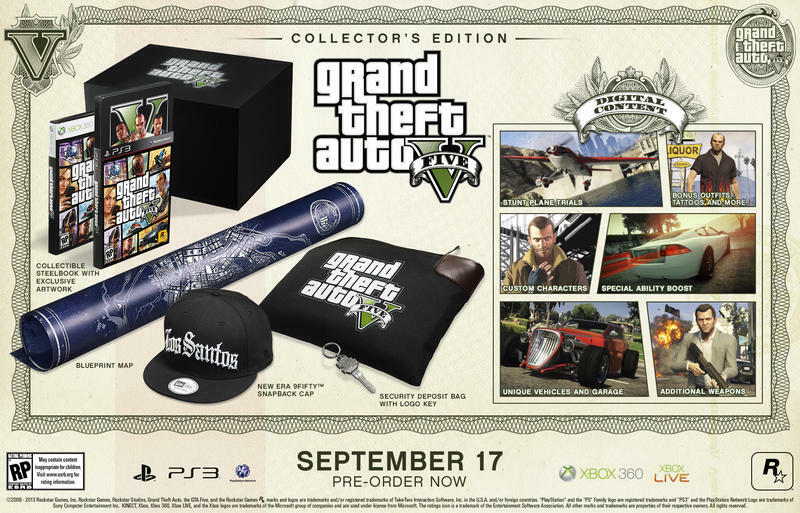 The Collector’s Edition features all of that, more in-game goods, a hat and a deposit bag. The Special Edition sells for $79.99, and the Collector’s Edition sells for $149.99. Grand Theft Auto V will hit the Xbox 360 and PlayStation 3 on September 17th, 2013. Will you snag a limited edition? New York, NY – May 23, 2013 – Rockstar Games is very proud to announce full details of the Special Edition and Collector’s Edition of Grand Theft Auto V® for the PlayStation®3 computer entertainment system and Xbox 360® video game and entertainment system from Microsoft, that are now available for worldwide pre-order from participating retailers. 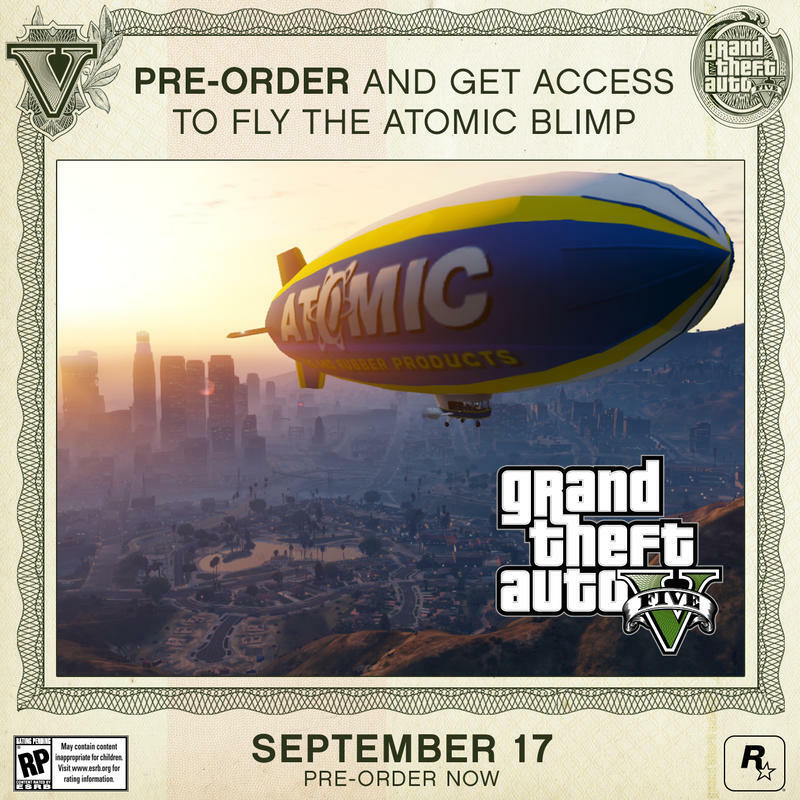 In addition, consumers who pre-order the Grand Theft Auto V Special Edition, Collector’s Edition or the standalone retail version now will be ensured access to the Atomic Blimp in-game vehicle. With every pre-order, players gain the ability to pilot the most iconic and leisurely aircraft in the Los Santos skies. Unique Vehicles and Garage Property – players will instantly receive a garage to store custom vehicles. In single-player, the garage will be stocked with the 1930’s style Hotknife hotrod and the CarbonRS sports bike. In Grand Theft Auto Online, players will get the high-end Khamelion electric car. 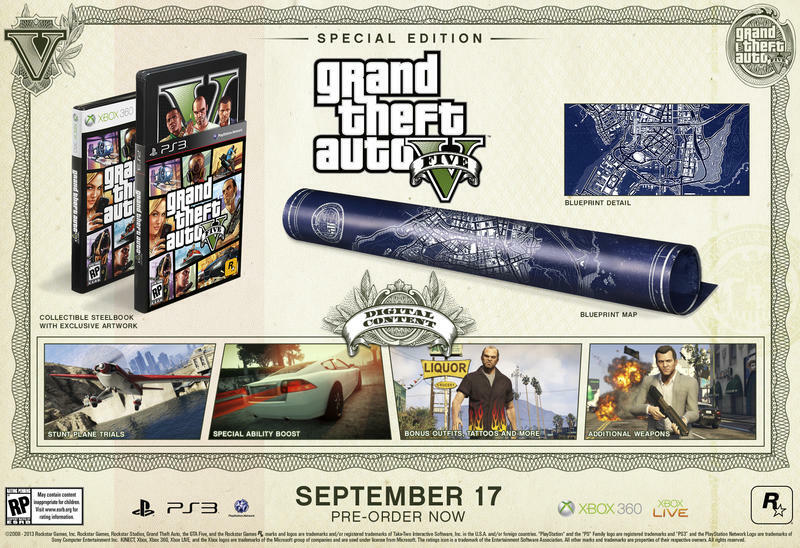 The Grand Theft Auto V Collector’s Edition comes packaged in a collectible outer box featuring a foil embossed Grand Theft Auto V logo on the top and finished with a matte, scuff-resistant film lamination housing all of the contents. The Grand Theft Auto V Collector’s Edition and Grand Theft Auto V Special Edition are the perfect way for fans to celebrate the return of this acclaimed series, with special digital content and exclusive Grand Theft Auto V physical items. Grand Theft Auto V Collector’s Edition will retail for $149.99, while the Grand Theft Auto V Special Edition will retail for $79.99. All versions are now available for pre-order until September 17, 2013 while supplies last. Check with your local retailers for pre-order availability and for more information please go to www.rockstargames.com/V.